Enthusiastic children arrived at the CIFA complex keen to take part in sixteen varieties of fun games and activities throughout the morning. 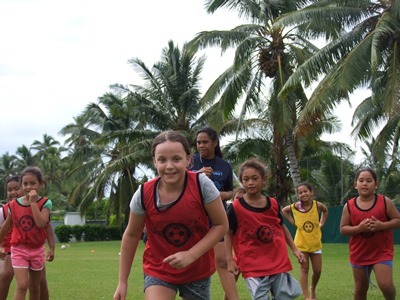 The active school holiday program was a hit with over 170 young boys and girls participating in the very energetic two hours of exciting games. Activities were organized on a rotational system to give all the children from ages 5 to 13 years old an opportunity to participate in the mixture of great activities and games. “We are delighted with the turnout of youngsters who were ready and willing to try all the fun soccer activities” said Just Play Project Manager Michelle Paiti. Laughter was heard throughout the CIFA complex and smiles could be seen on the great support of parents who also attended today’s event. “The participation was exceptional from all those who joined in the activities. The children cheering their team mates on, having fun and making new friends was good to see. We would like to acknowledge the parents for encouraging the children to attend our program” adds Paiti. The children were able to play in a fun, safe supervised environment with water breaks throughout the event. The day was topped off with fresh fruits to end the event on a high. “Our school holiday program is aimed at encouraging children to get outdoors and being active through the enjoyment of sport. Coaches and volunteers play a major role in these activities for the children,” Paiti continues. We would like to thank the coaches, volunteers who joined the CIFA team to deliver the fun soccer program.